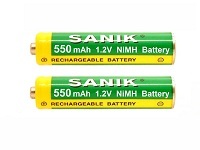 These are genuine Samsung 25R Li-Ion INR8650 batteries rated at 3.7V 2500mAh. The 25R2 (blue) batteries are being phased out, and replaced with the green 25R5 batteries. The specs are nearly identical, though the new green 25R batteries have a lower internal resistance, and a longer life cycle. Generally an excellent quality, reliable Lithium 18650 battery that gives consistant great performance. 2.High working voltage for single battery cells. 6.Capacity,resistance,Voltage,platform time consistency is good.